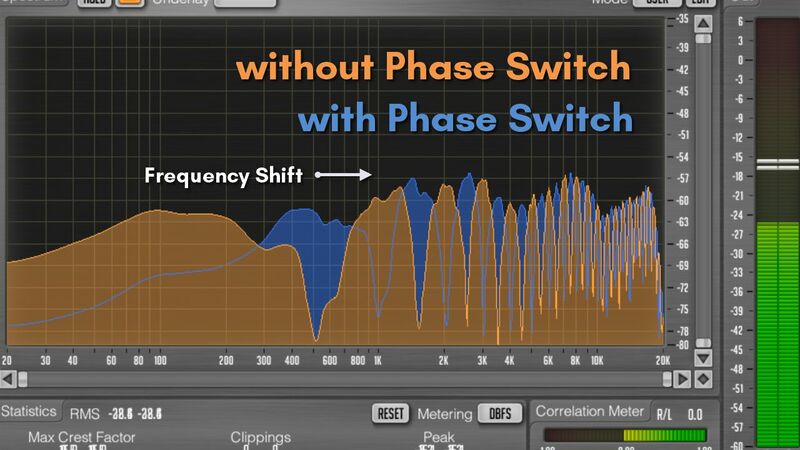 Do you really know what you are doing to your mix when you use the Phase Switch in your DAW or your mixer? I bet you don’t! In this first episode of faTutorial we will cover the issues with the ‘so-called’ Phase Switch and do some experiments that will surprise you even if you are a professional. Have a look! We are recording a 500 Hz Sine Wave with 2 microphones and a distance of 1 foot between each microphone. The time difference between each signal will result in a 180° phase shift. When the 2 recorded tracks are mixed together, they cancel each other out, resulting in an almost silent signal. Multi microphone test setup with two microphones and a Genelec speaker which emits a 500 Hz Sine Wave. each other out. Using the phase switch on one of the tracks could be a simple solution for our problem. The recording of the two Oktava Mk-012 in the DAW. Clearly visibile the opposite polarity and therefore the occuring Phase Cancellation. But is it really a solution? What does it actually do? By pressing the button we are simply reversing the polarity of the signal. Changing its positive components into negative ones and vice versa. 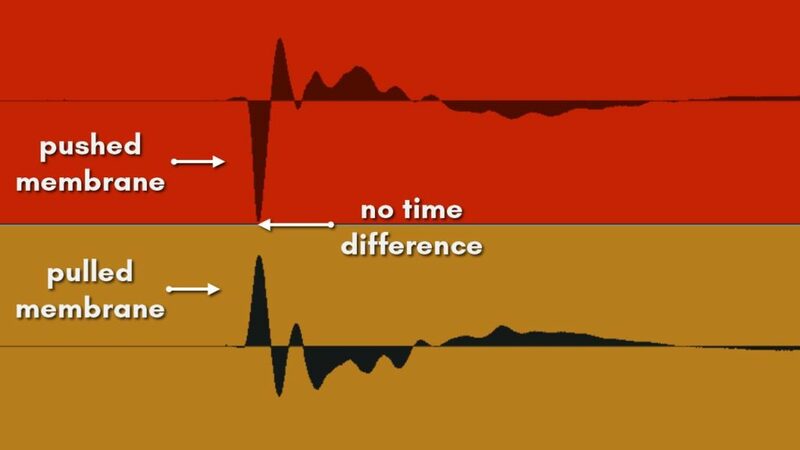 This simple trick works for a sine wave with a specific frequency, but it doesn‘t align the time difference between the microphones. It simply looks as if a 180° phase shift is applied but the time difference between both signals is the same. So to be absolutley correct: This button should be labeled „Polarity Switch“ or „PolarityReversal“. 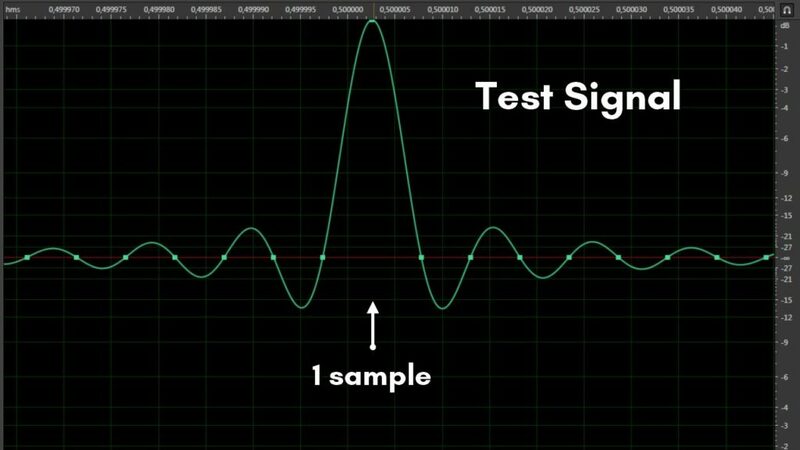 In reality, you are not recording pure sine waves. So, let‘s try the same setup with a white noise that contains all frequencies equally. 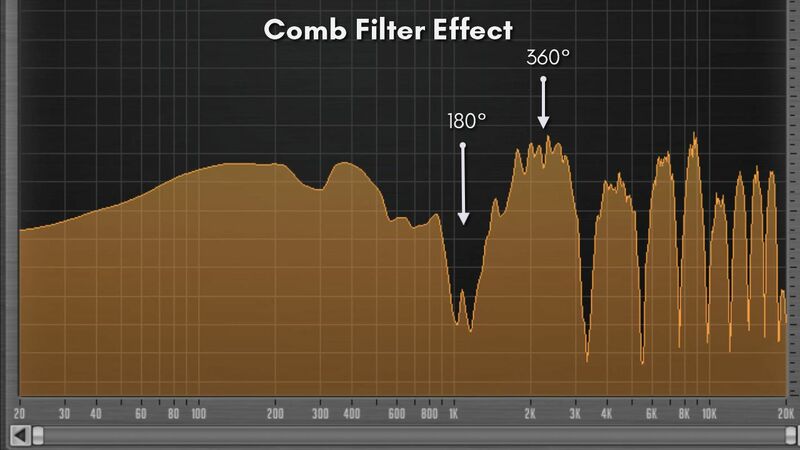 The comb filter effect distorts the white noise and results in different notch and peak frequencies throughout the spectrum. 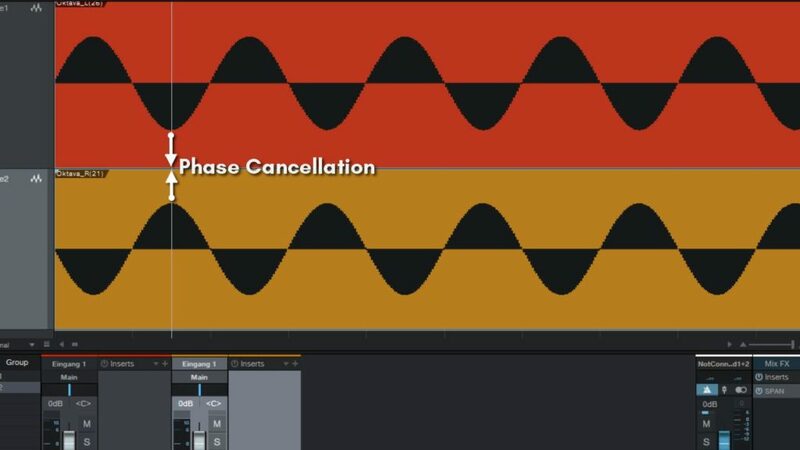 Mixing both signals together results in a so called „comb-filter“ effect. In the whole spectrum, different notch frequencies with multiples of a 180° phase shift, and peak frequencies with multiples of 360° phase shifts occur. The result is a heavy distortion of the original sound, an altered pitch perception and unnatural reverberation because of the artifical time differences. Can we solve this, with reversing the polarity, too? Although you might think that the Phase Switch will cure this phase issues it simple shifts the frequencies to the doubled frequency. No, we can’t! Reversing the polarity results in a change of the comb filter frequencies. Peak and notch frequencies are shifted but remain with the same intensity. So, it‘s not a real solution for this kind of situation. It‘s a workaround. It doesn‘t really cure the time differences between each signal. It can only shift canceling frequencies to a point where it could sound less annoying. Phase Switch for comb filtering or polarity issues? 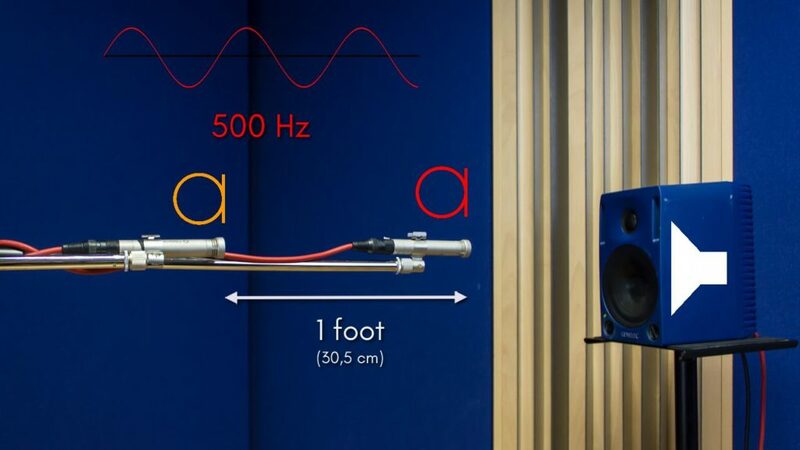 The distance between the speaker and the two microphones is equal but the membranes have opposing positions. Let‘s have a look at another kind of recording situation. 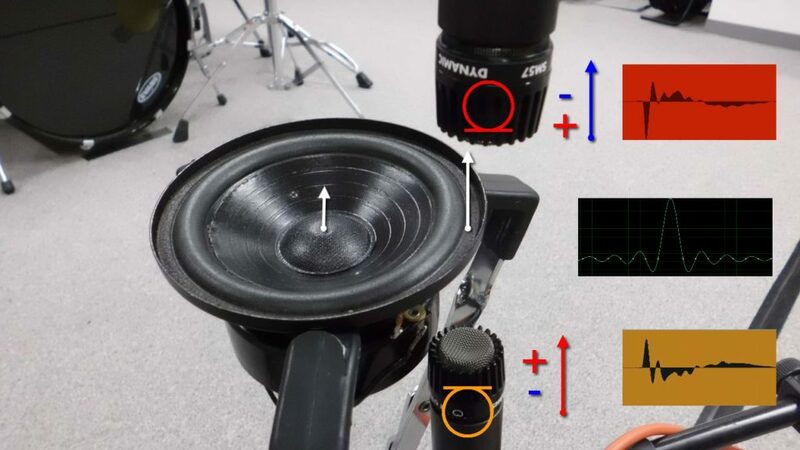 In this experiment we have to microphones in opposing positions and a single speaker between them. Our test sample is the shortest possible impulse. Infact it’s just one single sample, with maximum amplitude. The test signal that is played through the speaker: Just one single sample. The question is: What will it look like if it’s recorded through the microphones? The microphone membranes are clearly pushed or pulled opposite because of the speaker placement. and without any time difference. With polarity reversal this can be solved very efficiently. This time we clearly see no time difference between both tracks. But the polarity is opposite. 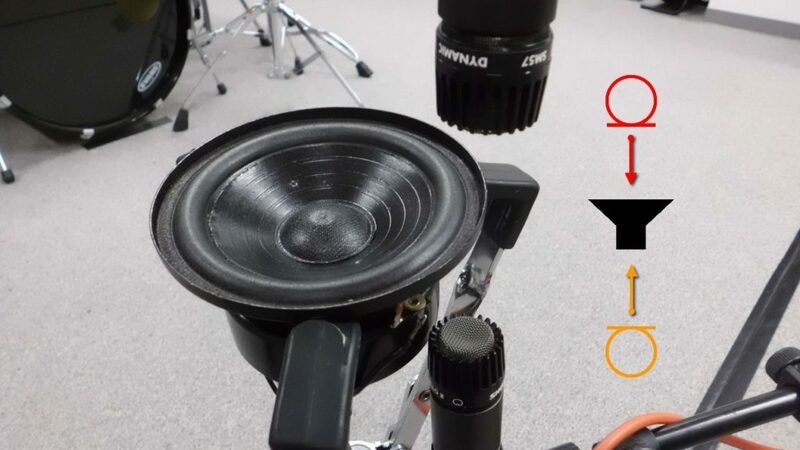 drum the polarity switch is the best possible solution. 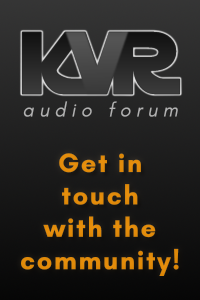 If you have a time difference between several microphones the polarity switch isn‘t useful at all. In this case the best solution is to align the time differences with a sample delay. But this will be covered in another tutorial video which will be coming soon. 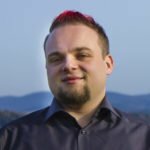 faSampleDelay - version 1.0 is coming!